Electricity distribution firms in Nigeria have accused the Minister of Power, Works and Housing, Babatunde Fashola, of spending taxpayers’ money on misguided projects. 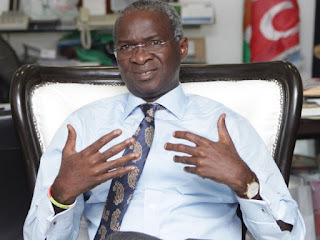 Fashola had on Friday condemned the reaction of the Association of Electricity Distributors to his directives to the Nigerian Electricity Regulatory Commission, Bureau of Public Enterprises and Nigeria Bulk Electricity Trading Plc. The minister had called the association’s spokesman an interloper and said his directives were aimed at legal entities and not to an unlicensed organisation, ANED, and that the Discos were sabotaging Nigeria’s economy through their actions. But reacting to Fashola’s latest attack on the association, the electricity firms alleged that with the minster in charge, an agency like REA was implementing a three-megawatt power project valued at N5.2bn or $5.6m per megawatt in Sokoto; and another two-megawatt plant in Anambra valued at N4.04bn or $2.02m per megawatt from taxpayers’ funds. "Why is this remarkable? It is remarkable because the government has robustly challenged, as exorbitant, the proposed price of $1.5m/MW put forward by power developers from the private sector and sought a reduction of same,” ANED said. The association also said, ”Should the TCN, an entity without a distribution licence, continue to engage in opaque ‘Eligible Customer’ transactions, rather than investing its limited funding in expanding and stabilising the grid, for increased energy to our customers, given its status as the weakest link in the Nigerian electricity supply industry value chain?